At least seven people have been killed and dozens more injured after a high-speed train in Turkey struck a railway engine and crashed into a pedestrian overpass at a station in the capital, Ankara. 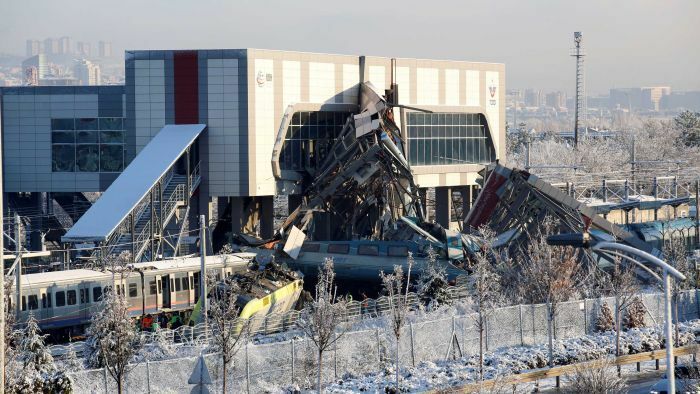 Ankara Governor Vasip Sahin said that the high-speed train was travelling to the central province of Konya when the crash occurred about 6.30am on Thursday (local time). So far, seven people have been confirmed dead and 46 people injured, with three of those people in a serious condition. Private NTV television said at least two cars derailed in the accident, with parts of the overpass then collapsing onto the train. The engine was checking the tracks at the capital’s small Marsandiz station at the time. Mr Sahin said that rescue teams were at the scene looking for more survivors. Video footage from the scene shows rescue workers trying to free people who are trapped in beneath the mangled metal wreckage of the overpass at the Marsandiz train station. “Our hope is that there are no other victims,” he said. It was not immediately clear if a signalling problem caused the crash. Mr Sahin said a technical inspection has begun while NTV television, quoting unnamed officials, said three prosecutors were assigned to investigate. It is the second fatal train crash in Turkey this year. In July, 10 people died after a train in north-west Turkey derailed following heavy rain and a landslide. Five carriages went off the track, injuring another 73 people.